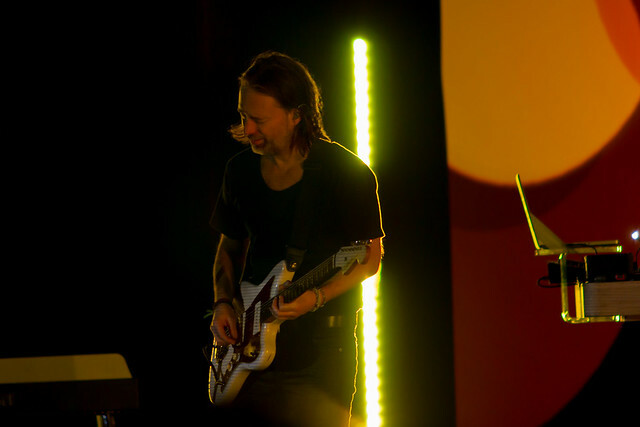 On Saturday, December 8, Radiohead frontman, Thom Yorke, played the Stifel Theater as part of his “Tomorrow’s Modern Boxes Tour.” The show, which focused primarily on Yorke’s solo work, included only two other performers – longtime producer, Nigel Godrich, and audiovisual composer, Tarik Barri. The result was a spare, almost empty stage dominated only by Yorke, a handful of instruments and the shifting light patterns created by the video installation. Despite the minimalist staging, the concert was a sensory-rich experience, full of saturated color and intricate, layered sound. That feint, the illusion of simplicity disguising unfathomable complexity, is common to all of Yorke’s work. Even the recent ‘Suspiria,’ written as the soundtrack for the Luca Guadagnino film, takes skeletal piano lines, undergirds them with sighing vocals and electronic noises, and still manages to produce a sonic masterpiece. Most artists need a full palette to achieve greatness. A true master only needs a few colors.